FutureLearn.com just launched and now has been added to our listing. There are 20 courses offered by this provider. 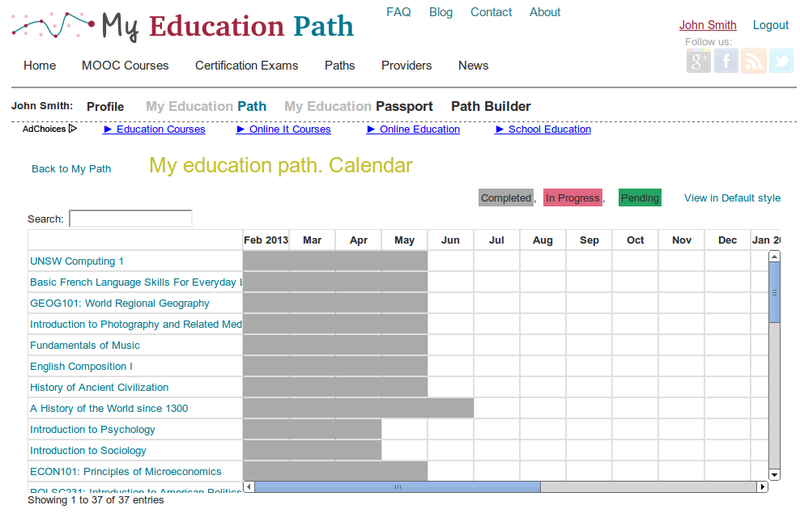 Now our users can comment and rate courses, add to personal education path and calendar, store in the education passport after a courses completing. Tired to study MOOC at home? We have new feature to solve this problem. The listing of places to study MOOCs and online courses. We just launched it and now there is only one place – MOOC Campus. However, we expect the community will help to extend this listing and add more places in different areas. Studying MOOCs out of home has many benefits. A tusdent can find friends to study a course together. Group study is more effective in many cases. And it is more easy to organize practice training related to a MOOC to get new skills after a theoretical study. If you know good places for independent study MOOCs in your area then, please, suggest us and we will add to the listing. 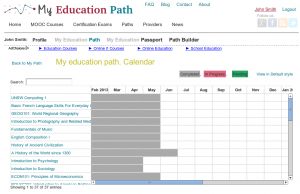 We continue to improve personal education planning tools. Today we release experimental version of calendar view. This layout is called “Like MS Project”. By default, old view still work. But it is possible to open new layout with the link “View in “MS project” style”. Let us know if this is correct direction of Calendar GUI developement! The calendar is the part of My Path tool.